There are various types of bridles out there for you to choose. Bridles either come with a bit or without. This review examines characteristics of a bitless bridle and various brands. A bitless bridle controls a horse without a bit in their mouth. The bridle offers the same amount of control as horse bridles and bits. The Nurtural bitless bridle is a newer bridle on the market. This bridle has a solid crown piece to maintain even reins. The rein straps are shorter as well to improve control. One of the main problems with the nose piece on a bitless bridle is that it doesn’t stay in place, this brand has a textured nose piece to help it stay in place. The Nurtural bitless bridle also has an adjustable Circle-X under the chin to allow it to better fit your horse. It also allows for an extra pressure point to slow or stop the horse. This bridle is said to be very user friendly. Riders who want to try a bitless bridle have tried a Nurtural bitless bridle and have been very successful without any horse training tips on using the bridle. Dr. Cook’s bitless horse bridle has been around for a few years now. Many people have used this bridle and been very happy. This bridle is available in many different materials. It can be found in leather, vinyl covered nylon, and webbing. Each material offers different results for different users. The vinyl covered nylon doesn’t stay on the nose as well as the leather one and the horse tends to sweat more under it. The nylon one is easier to care for and clean than the leather bridles. 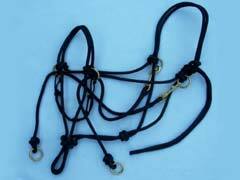 The leather horse bridle variety offers better control of the horse. No matter what the material users feel safe and confident about using a bitless bridle. No matter what bitless bridle you choose make sure it offers comfort for your horse and control of your horse. A bitless bridle offers control in a more humane way than a bridle with a bit. Bitless bridles can be found at a western horse tack shop where you can get more information about them. Both bridles are comparable in price.